Flip-flops, iPods, MySpace, “Dude,” Instant Messaging. Whatever happened to dress shoes, sir/ma’am, in-person meetings, and traditional work etiquette? A workplace revolution is underway, one that is stimulating new methods of thinking, behaving, communicating, and doing business as Generation Y continues to infiltrate the workplace and influence corporate culture. This revolution is lead by approximately 60 million Gen Yers, the largest bloc to hit the workforce since the 72 million baby boomers. Company owners and managers are worried, because this generation has created its own unique culture...and demands. •Psychological insight into the character of this generation. 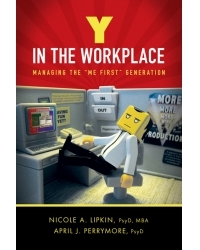 •Strengths and challenges that Generation Y is bringing to the workplace. •Coaching strategies and ways to harness their strengths, minimize their weaknesses, and illuminate their talents. into your company and work with them. Nicole A. Lipkin, PsyD, MBA, is the owner of Equilibria Psychological and Consultation Services, LLC, a group psychology practice. Her personal practice includes executive and leadership coaching and assessment, team-building services, and coaching and training services for Generation Y employees and those who manage them. April J. Perrymore, PsyD, owns an independent psychological practice. She specializes in working with small-business owners and entrepreneurs. Previously, she was an assistant professor of psychology, teaching and advising Generation Y.